A fascinating 1892 Rand McNally and Company map of the Oklahoma and Indian Territories. It covers the Oklahoma Territory and the Indian Territory prior to the before they were admitted as a single state of Oklahoma in 1907. 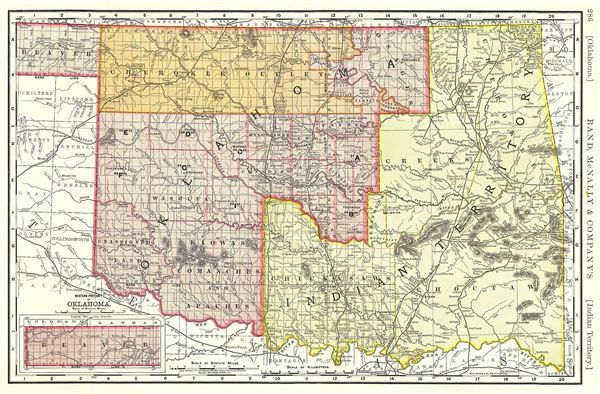 An inset in the lower left quadrant features the western portion of Oklahoma. This map is highly detailed and notes several major cities, towns, rivers, mountains, Indian tribes, railroads and a host of other topographical features. The map also delineates survey grids and plats referencing the work of the U.S. Land Survey. Elevation is rendered by hachures. This map was issued as plate no. 286 in the 1893 edition of Rand McNally and Company's Indexed Atlas of the World- possibly the finest atlas Rand McNally ever issued. Rumsey 3565.132 (1897 edition). Philips (atlases) 1026 (1898 edition).